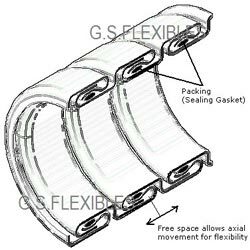 G.S.FLEXIBLES manufactures very Interlock Hose. It has excellent crush resistance and offers excellent protection against axial elongation. In all the types, invariably heavy gauge of strip is used making it ideal for industrial and other demanding applications. The GSF Pressure hose is designed to transfer fluid at high temperature and pressure. It is a fully interlocked hose; and is also known as double interlocked hose in common parlance. Quality packing is also inserted while formation of hose (as shown in the Figure), which acts as a sealing gasket. Thus the special design allows for pressure tightness along with the moderate flexibility. The extremely high temperature of ordinary welding process destroys the packing of hose in adjoining area. Thus a set of specially designed fittings is available for P-1000 hoses. However if the fitting has to be joined with welding process, the adjoining pipe must be sealed using proper sealants for pressure tightness. GSF pressure hose is manufactured in hot dipped galvanized steel I.D. sizes range from 1/2" through 10". The Nominal Burst Pressure, PSIG pressure given in specifications chart should be taken as a general guideline for the selection of hose. The data is in accordance with the test conducted at the factory. However the actual performance of the hose depends on the correct installation and proper handling. For critical applications and extra-ordinary work conditions, the customers are advised to consult the factory. The product can be customized for specific application requirements. GSF pressure hose is fully leak-proof within the pressure limits and can transfer fluids in wide temperature range- 20°~250°C. Besides, its special formation allows it to hold the shape. These characteristics make P-1000 pressure hose suitable for wide industrial applications. Typical applications include transfer of tar and bitumen in highway commissioning, oil refineries, barge and tank car unloading, chemical handling in fertilizer plants and similar industry. Besides Pressure Hose is a general-purpose hose widely used for suction, hot air blow and fume and dust collection. Disclaimer : The data should be used as general product selection guide. The actual performance of the hose depends on the work conditions, careful handling and proper installation. Since these factors are beyond our control, the hose does not come with any warranty or guarantee.